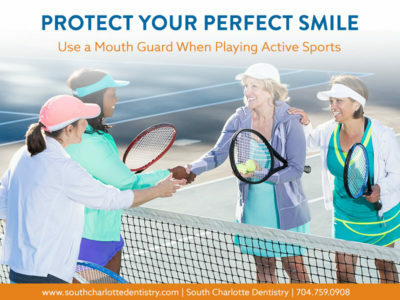 South Charlotte Dentistry has an array of mouth guards that can meet various dental needs. And though most of us know that athletes wear mouth guards (they are essential to protecting against dental injury), there are many other types of people who would benefit from a custom-fit mouth guard. Let’s consider some of the uses for mouth guards, as well as, what they used to be like years ago. Also, we can take a peek into the future and catch a glimpse of what mouth guards will be like as technology continues to improve design and function. So who needs a mouth guard? Well, let’s begin with the most likely answer: athletes. Contact sports, like football, basketball, lacrosse, boxing, soccer, hockey—pretty much most sports—present the need for a mouth guard. If you are likely to be knocked down or fall over in some way, you are going to need one. The dental injuries that contact sports present to the average athlete are more easily prevented when wearing a guard. And even if you don’t play a contact sport, but do participate in what’s termed “contactless sports,” chances are that a mouth guard is a safe bet for you too. Gymnastics, for one, is a contactless sport that still presents the possibility for dental injuries. And what about skateboarders, mountain bike enthusiasts, city cyclists? Yup, a mouth guard can surely benefit those who partake in such recreational activities, too. There’s a second group of candidates for mouth guards, who aren’t athletes: those who tend to grind their teeth at night. 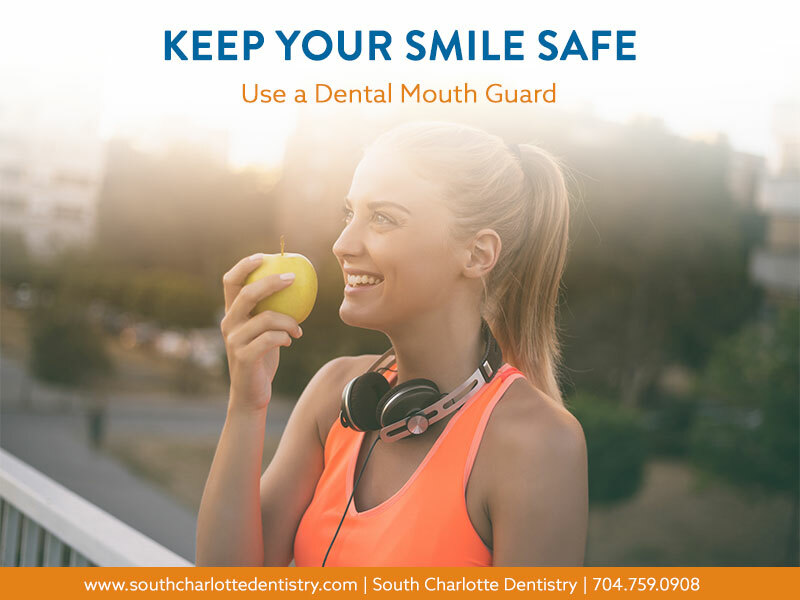 Though teeth grinding can be an annoyance for those who suffer with it, South Charlotte Dentistry makes custom-fitted mouth guards that can help to amend the damage caused by grinding. To fix that, we make what’s called a “nocturnal bite plate” or a “bite splint,” which are dental appliances that can help to prevent tooth damage. Pre-formed, stock mouth guards can be a great way to take advantage of the benefits for wearing a mouth guard, and certainly cost less. They are available in most sporting goods stores; therefore, they seem an easy go-to for the busy soccer dad or average, multitasking mom. However, because they are not custom-fitted, they can feel a bit more awkward in your mouth or even get in the way of breathing during physical activity. Talking with them in your mouth can be difficult, and the worst part is that they do not do much to protect your mouth at all. Dentists discourage use of them! Boil and bite mouth protectors are simple to use and make for an improvement on stock mouth guards; however, they have both advantages and disadvantages. They are cheaper than a custom-fitted mouth guard and they do offer a better fit for your mouth than stock guards bought at a sporting goods store—a definite advantage. They are made of thermoplastic which, when set into hot water, softens and can be molded to your mouth by using the pressure exerted by your fingers and tongue. A major disadvantage is that they are not custom-molded to your mouth and its needs. Custom-fitted mouth guards are our highest recommendation. Our dental team at South Charlotte Dental, led by Dr. Wells, will take a mold of your teeth (upper or lower jaw, or both if needed) and will make a fully customized mouth guard. This means that the guard only fits your mouth and makes for the snuggest, best fit possible. Although this is on the higher end of cost, consider that it’s the easiest way not to rack up a huge dental bill. Although most mouth guards are worn on the upper teeth, Dr. Wells can make guards for your lower teeth as well. In a consultation with him, he would assess your needs and determine the best custom fit for your treatment. And here’s what you can expect a custom-fitted mouth guard to be: well-fitted and comfortable, easy to clean, durable, less restrictions on your breathing or talking, and they should not cause pain when worn. Can mouth guards be fitted over braces? Yes, certainly! In fact, a mouth guard won’t just protect your teeth and gums, but it will also help to protect the costly braces or other fixed dental appliances you wear, like bridge work. So yes, Dr. Wells at South Charlotte Dentistry will not only look after you in terms of braces or bridge work, but he can craft custom-fit mouth guards to protect that dental work too. So whose idea were they, and where did they come from? A London dentist, in 1890, first developed the mouth guard and called it the “Gum Shield.” Dr. Woolf Krause designed it with boxers in mind, especially to prevent lip cuts. When Dr. Krause made them, they were formed from gutta percha, a substance that has been used in dentistry work for years. Then his son, both a dentist and amateur boxer, innovated his father’s design and crafted guards from vella rubber. By the late 1920s, mouth guards were in common use among boxers. Then, in the late 1940s, Dr. Rodney Lilyquist, in Los Angeles, developed a custom-fitted mouth guard that was molded to fit both upper and lower teeth. He made it from acrylic resin, which meant it was more transparent and less noticeable. Also, his mouth guard was more comfortable to wear, so basketball and football players began to adopt his guards. And guess who else took notice and promoted his innovation? The American Dental Association, that’s who! Since then, the ADA has researched and explored different kinds of mouth guards, both their design and the material from which they are made. They got behind the mouthguard and by 1962 all high school football players wore them; by 1973 the NCAA adopted them for use amongst all basketball players. And since the ADA promoted them, the number of dental injuries among athletes have dropped significantly. And today, the American Dental Association recommends the habitual use of mouth guards in 29 different sports. The mouth guard pays dividends in dental health and safety. Surely you’ve heard all the rage about 3D printing, right? It is bound to be the wave of the future, and it’s exciting to know that this technology is coming into dental offices all around the country. The use of 3D scanners for medical or dental procedures promises to break new ground for how doctors and dentists will treat diseases and craft medical appliances in the future. So what does this new technology promise, in terms of a dental visit? In the future, a patient won’t need to sit in the dentist’s examination room waiting as dental impressions are taken in silicone and then used to mold the custom-fitted mouth guard. Nor will a patient need to sit through numerous X-rays while biting down on plastic guards. Even though that’s where things are at right now—and it represents some of the best technology to date—the innovative techniques available to us with 3D scanners will mean even less wait times and less sense of stress or anxiety. What will 3D scanners do, and how will they work to make the future of dentistry more innovative and a patient’s visit to her dentist easier? Digital scanning by 3D scanners means that a dentist can get a full scan of your teeth, gums, and jawbones. This scan is digital, less intrusive, and far more comfortable for the patient, for it uses cameras to make a digital impression of the patient’s mouth. Then the dentist reads the date and can quickly size up the best mouthguard for your dental needs. Not only will the mouth guard of the future still be a custom-fit for your mouth, and also easier on the patient when taking the impression for it, but it will also be printed right there in the office! Yes, the future is 3D scanning and 3D printing. Once your mouth has been scanned, the 3D printer would go into action and, in a series of minutes, print the custom-fitted mouth guard that is the best possible fit for your mouth. You would simply slip it on, right there in the examination room, and talk through the care and wearing of your new mouth guard. It will be that simple in the future! And just to elaborate a bit further: 3D scanning will do so much more than create a scan of your mouth for a mouth guard. It can be used by your dentist to better understand the best strategy for extracting a wisdom tooth, install dental implants, or fit dentures. That is just a little bit of what including 3D scanning in a standard office visit will mean for your future visits to the dental office. South Charlotte Dentistry intends to bring the ease of 3D scanning to its examination rooms, and our patients will be the beneficiaries. It means more precise care. It means more detailed understanding of the shape of your mouth and teeth. It will mean improved diagnosis of dental problems, and it will aid us in the prevention of future dental issues. 3D scanning means we get better information on your mouth, gums, and teeth, which means we have more tools at our disposal and more options on the table for treating dental conditions. And this 3D technology means dentists can transfer imagery to dental labs, for further evaluation or developing more specialized appliances to treat dental conditions. In fact, there are labs right now that are testing 3D printing of dental appliances, such as mouth guards, using carbon resin. That is a versatile material that is both incredibly strong and easily shaped. The promise of carbon resin is that it’s more affordable than previous materials that labs have experimented with, and it creates less waste when used. New technologies and new materials will mean, in the future, new ways to make good dentistry work even better for dental patients. South Charlotte Dentistry and the team Dr. Wells has put together are excited about the kind of future promised us all by 3D scanners and printers. We presently have some of the best technology and innovative techniques for taking impressions of your teeth and gums in order to make you the best, custom-fitted mouth guard. So, even though our eye is on the future and what it will do to improve the lives of our patients, our steady hand is on the present and bringing to you the best care we have. We encourage you to take stock of your athletic activities—how frequently do you participate, have you considered the risks your activities might pose to your dental health—and come see us to be fitted for a custom mouth guard. Or, if you wrestle with teeth grinding at night, we can get you fitted for a guard that will protect your teeth. Come see Dr. Wells and the team at South Charlotte Dentistry today!